The term sustainability can be a yawn for some. But for many if not all, it is a significant risk with the notable volatility of resources and commodity prices, in an increasingly competitive global landscape, where technology is driving ever-decreasing costs. And for some Green Giants it is a billion dollar opportunity. In exploring opportunities how businesses can mitigate risks, address changing customer needs, and truly connect purpose with profit, I wondered if we have been over-complicating things, and if there is a more simple approach. I believe that applying the 3R principles of Reduce, Reuse and Recycle to the three key areas of business — Assets, Ecosystem, Model can help to unlock ways to mitigate risk and realize growth. This simple framework can help to identify gaps and benchmark best practices, where the greater the scale of R activation the greater the potential for long term value creation. Reduce = a net reduction in what you use and/or in what you throw away. Such as using less disposable products, using more durable goods, reducing packaging waste, and swapping in alternative goods or resources that are more environmentally friendly. Reuse = extending product life through repeat usage. Albeit reusing for the same purpose, repairing, re-gifting, repurposing or upcycling. Upcycling being where unwanted materials are reused to create a new product with a higher value that the original. Recycle = breaking down used or waste goods to base materials to be remade into new products. This being either a fresh supply of the same original product, or forming part of a different new product. When thinking about the why, what and how of your business, it goes without saying that successful businesses are led and anchored by a clear, unique and relatable purpose, a compelling customer value proposition, and a motivational definition of success beyond just pure financially-based measures. 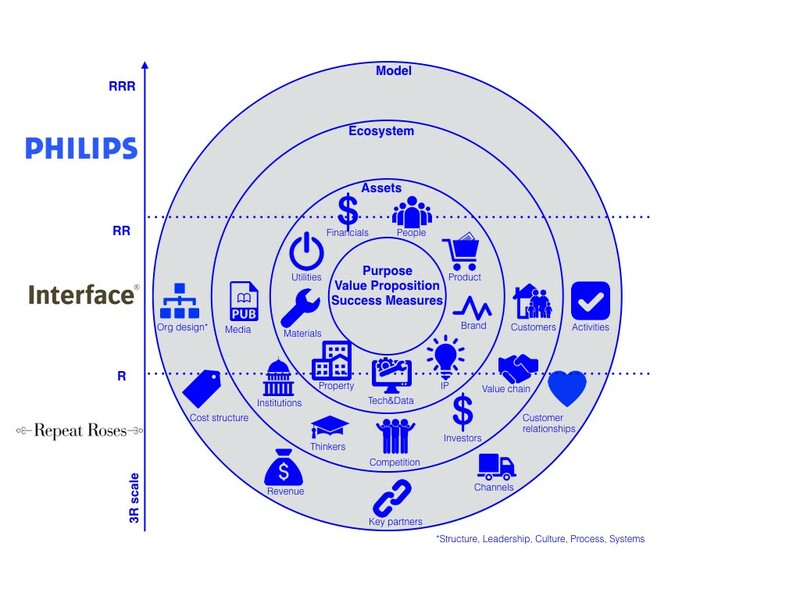 As you consider the Assets, your Ecosystem and the Model you apply, how might you grow through the 3R principles? How might you Reduce, Reuse and Recycle the human, intellectual, natural, financial and manufactured Assets you have and use? How might you adjust your relationships with the players and stakeholders in your Ecosystem? How might you change the way you “create, deliver and capture value” (drawing from Alex Osterwälder and Pigneur’s Business Model Canvas)? R — Take Repeat Roses who are on a mission to “shift the paradigm in the event industry by reimagining the single-use floral arrangement concept to spread joy and ensure sustainability”. To me this is perfect example of a for-profit business extending asset-life and reducing waste. Repeat Roses collect high-end flower arrangements from events. They reuse and donate appropriately re-styled arrangements matched to patients in the local community. The twice-enjoyed flowers are then reclaimed for composting. Landfill is reduced and valuable nutrients are returned to plants and soils. By extending the life of these floral arrangements, patients receive a joyful surprise, customers gain the feel-good factor of giving and can claim a giving tax deduction and/or clients can incorporate this into their CSR initiatives. RR — At the next level, Interface are the pioneers of the innovative modular carpet tile, making it easy to repair and replace, and reducing carpet waste. This reduction in waste along with “increasing the use of renewable materials and energy sources” into their manufacturing process, are propelling them forwards ever closer to their 2020 Mission Zero®, to have no negative impact on the planet. They are leading their category in sustainable best practices while also working on building their sustainable system. They have reduced their “..average product’s carbon footprint by 34% since 2008”. They invest in reducing direct impacts in addition to carbon offsets for each phase of their carpet title lifecycle. Their Cool Carpet™ program calculates and offsets remaining emissions from the harvesting of raw materials, to manufacturing, distribution, usage and end-of-life recycling. And they are working with their partners to do the same. RRR — A great example of ‘high scale’ RRR is that of Philips, where they are creating value by moving from linear to circular business models. Notably in their lighting and healthcare businesses they are moving to “more service-based business models” with recurring revenues per Frans van Houten, the President and CEO. For example, by offering Energy Efficient Lighting as a service, replacement cycles, energy bills and selling expenses are reduced, and the product comes back to Philips to be reused or recycled at the the end of its lifecycle. Customers benefit from the service and have a richer experience, over a longer time period. Shareholders appreciate the predictability of recurring revenue streams. Philips “..recuperates the value of the product when it comes to the end of its lifecycle”. Their products are increasingly modular in design that allows for the reduction of replacements and easier repairs. It also maximizes material recovery, making it easier to reuse and recycle, and so extending product life. Accenture research “..indicates a $4.5 trillion reward for performing circular economy business models by 2030”. So as you look for pockets of growth and ways to mitigate risk, how might you look at your assets differently? How are you tracking your assets and considering endless-use? How might your evolve your relationships and the value-exchange with your ecosystem? And how might you shift your business model from product to service-led? And perhaps we could have a comprehensive way to evaluate and celebrate business success on a 3R scale over short and medium time scales? Your thoughts and links to other leading value creation frameworks are most welcome!